IFS is a process engineering firm that builds a wide range of modular systems for the Air Quality/NOx Reduction Industry. All of our products are skid-mounted and ready to “plug-in.” Our engineers will build-to-suit according to your exact specifications and can install your completed modular system anywhere in the world. 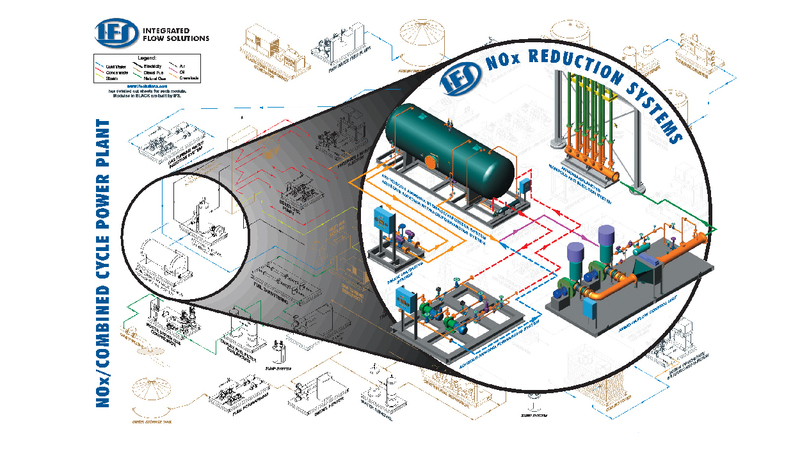 Integrated Flow Solutions Ammonia Unloading, Storage, Distribution & Vaporization System is designed to provide ammonia (anhydrous or aqueous) reactant to a Selective Catalytic Reduction (SCR) unit for removal of NOx from flue gas. Ammonia is delivered by truck or railcar and unloaded into storage tanks. The ammonia is forwarded to the Ammonia Flow Control Unit (AFCU) which generates ammonia gas for injection into the flue gas upstream of the SCR. IFS provides the complete system. Controls the flow of Ammonia from the Ammonia Storage/Forwarding System into an air or flue gas stream. The air is typically heated & pressurized with an electric process heater or low pressure steam heat exchanger. Controls the flow of Ammonia from the Ammonia Storage/Forwarding System into an air or flue gas stream. The hot flue gas is available from the gas turbine exhaust & is typically pressurized with hot gas blowers. Electrically vaporizes anhydrous and aqueous ammonia flowing through a process. Accurate temperature control is maintained with full thyrister power controls modulating the current to the flanged heater element.